Looking for a place to eat while driving through Kansas on I-70? 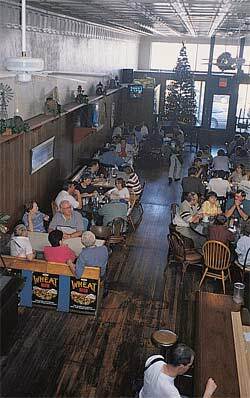 We highly recommend the Western Kansas Saloon and Grill in WaKeeney, known as the ” Christmas City on the High Plains”. This former gambling hall and hardware store now serves hearty steak, pasta and seafood dishes in a great Old-West atmosphere (don't miss the tin roof! )–and reasonable prices to boot. Our group enjoyed delicious steak, prime rib, pasta and pork entrees — all for around $15. It's a friendly place, too. While we waited for our meal, we noticed a lot of folks walking around, talking to other customers. We spoke with friendly owners Kenny and Lien Quan. WaKeeney is just north of I-70 in western Kansas, at the junction of Business U.S. Highway 40 and U.S. Highway 283, 122 miles west of Salinas. The restaurant (121 N. Main St.) is open from 11 a.m. to 2 p.m. and 5-9 p.m. Tuesday through Friday; it's open a 1/2 hour later on Saturday and only from 5-9 p.m. on Sunday. To learn more, call 1-785-743-2050.